^ Agrawal, Nina. 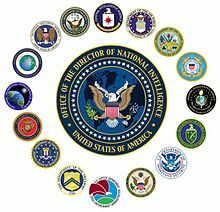 "There's more than the CIA and FBI: The 17 agencies that make up the U.S. intelligence community". Los Angeles Times. Retrieved 2017-01-30. ^ "Members of the IC". www.odni.gov. Office of the Director of National Intelligence. Archived from the original on 17 November 2018. Retrieved 2018-11-17. ^ Dana Priest & William M Arkin (19 July 2010). "A hidden world, growing beyond control". The Washington Post. ^ Michael Warner; Kenneth McDonald. "US Intelligence Community Reform Studies Since 1947" (PDF). CIA. p. 4. Retrieved 28 June 2013. ^ Rosenbach, Eric & Aki J. Peritz (12 June 2009). "Confrontation or Collaboration? Congress and the Intelligence Community" (PDF). Belfer Center for Science and International Affairs, Harvard Kennedy School. Retrieved 21 July 2009. ^ User, Super. "Members of the IC". Archived from the original on 2016-03-01. Retrieved 2016-02-10. ^ "What is Intelligence?". www.odni.gov. Office of the Director of National Intelligence. Archived from the original on 17 November 2018. Retrieved 17 November 2018. ^ "DNI Releases Budget Figure for 2010 National Intelligence Program" (PDF). Office of the Director of National Intelligence. 2010-10-28. Retrieved 15 June 2013. ^ "DNI Releases Budget Figure for 2009 National Intelligence Program" (PDF). Retrieved 15 June 2013. ^ "DNI Releases Budget Figure for 2008 National Intelligence Program" (PDF). Retrieved 15 June 2013. ^ "DNI Releases Budget Figure for 2007 National Intelligence Program" (PDF). Retrieved 15 June 2013. ^ Hacket, John F. (2010-10-28). "FY2006 National Intelligence Program Budget, 10-28-10" (PDF). Office of the Director of National Intelligence. Retrieved 15 June 2013. ^ Matt DeLong (29 August 2013). "Inside the 2013 U.S. intelligence 'black budget'". The Washington Post. Retrieved 31 August 2013. ^ Matthews, Dylan (29 August 2013). "America's secret intelligence budget, in 11 (nay, 13) charts". The Washington Post. Retrieved 31 August 2013. ^ a b Barton Gellman & Greg Miller (29 August 2013). "U.S. spy network's successes, failures and objectives detailed in 'black budget' summary". The Washington Post. Retrieved 31 August 2013.